LIP INK® Semi-Permanent Cosmetics - Paint the skin under the brow to create the illusion of fuller brows or cover areas that have no hair. You can wear it with confidence 24/7 (even to bed). You can also use it to line the lips and eyes. 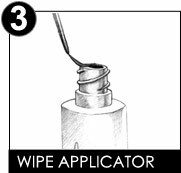 Remember to let the applicator breathe before applying to the eye area. Men can wear this product to add the look of facial hair where there is none, giving their beard or mustache a fuller look. 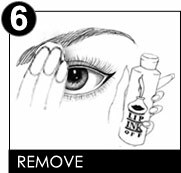 Make sure the brow area is clean and free of oils, creams and lotions using IP-INK Off Conditioning Remover then splash with water and pat dry. 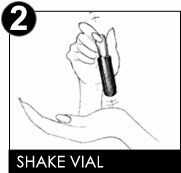 Shake the vial of LIP-INK MIRACLE BROW LINER against the palm of your hand until the beads move freely. Apply LIP-INK MIRACLE BROW LINER to the skin beneath the brow working with the natural growth of hair. 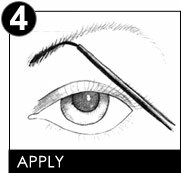 The MIRACLE BROW LINER may be layered depending on desired depth of color. 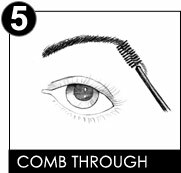 Comb through with the brush provided to reduce shine and integrate color into the existing brow line. Miracle Brow Tint is used on the brow hair directly to cover grey, or darken brow hair. You can wear it in your hair as well to streak or give it a full color coverage. LIP-INK EYE and MIRACLE BROW products dry in approximately 30 seconds. LIP-INK Miracle Brow Tint is 24-7, (wear to bed) color. 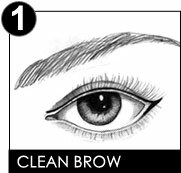 To remove MIRACLE BROW LINER, saturate a make-up pad, a cotton ball or a warm. moist, dark colored washcloth with the LIP-INK OFF solution. Press to the brow area for a few seconds then gently wipe (never scrub) to remove the finish. Splash with water and pat, dry. tor. Remember to open the vials carefully, as LIP INK®'s formulas are LIQUID. They can spill, or splatter and when in contact with clothing, carpet, etc. may stain. NOTE: The LIP INK® waxfree, guaranteed smearproof & long-lasting, multi-patented color product line is not compatible with any other cosmetic products. LIP INK® Color Cosmetics are based on scientific research and are protected by U.S. and International patents. Competitive products cannot legally duplicate LIP INK® Color Cosmetics and their precise chemistry. New customers should start with a kit when purchasing any of our guaranteed smearproof color. Choose from 5 shades of waterproof, smear proof brow liners that give a fuller, natural, healthier look. Lip Ink's handcrafted lip stain colors and 3 process smear proof technology is revolutionary. Our 3 product ECO system, consists of Water, Oil and Botanical blended liquid brow liner smear proof color. Sd Alcohol 38-B. Di Water. Castor Oil. Cellulose. Ethylcellulose. Octylacrylamide/ Acrylates/Butylaminoethyl Methacrylate Copolymer. Rosemary Oil. Rosemary Extract. Matricaria Extract. Red Clover Oil. Althea Extract. Oak Bark Extract. Calendula Extract. Comfrey Leaf Extract. Echinacin. Sage Oil. Sage Extract. Cornflower Extract. Golden Seal Root Extract. Burdock Root Extract. Peppermint Extract. Dandelion Root. Ginger Root Extract. Bayberry Bark Extract. Skullcap Extract. Valerian Extract. Parsley Extract. Fennel Extract. Barberry Bark Extract. Prairie Dock Root Extract. Eye Bright Extract. Red Raspberry Extract. Plantain Extract. Slippery Elm Extract. Chickweed Extract. Arnica. Blessed Thistle Extract. Elecampane Extract. Oat Extract. Grape Seed Extract. Beta-Carotene. Allantoin. Alumina. Arrowroot. Green Tea Extract. Chlorophyl. Silicon Dioxide. Glycerin. Ethyl Vanillin. Dipotassium Glycyrrhiziate. Butylene Glycol Algae (Ahnfeltia Concinna Extract) Extract. Silica. Ascorbyl Palmitate. Ascorbic Acid. Citric Acid. Alumina Hydroxide,. Sodium Sulfate, Potassium Sulfate, Lithium Sulfate, Magnesium Sulfate, Calcium Sulfate, Zinc Sulfate, Phosphorus Phosphate, Copper Sulfate, Manganese Sulfate, Potassium Borate, Potassium Iodine, Calcium Chloride, Lithium Borate And ... INTEGRITY.� EMPOWERMENT.� LOVE.� FREEDOM�. Di Water. Disodium Cocoamphodiacetate. Trisodium Phosphate. Glycerin. Aloe. Phenoxyethanol. Poloxamer 407.Xanthan Gum. Sodium Saccharin. Sodium Sulfate. Potassium Sulfate. Lithium Sulfate. Magnesium Sulfate. Calcium Sulfate. Zinc Sulfate. Phosphorus Phosphate. Copper Sulfate. Manganese Sulfate. Potassium Borate. Potassium Iodine. Calcium Chloride. Lithium Borate. I purchased the blonde shade, but I found it to be too watery. I expected it to be a little thicker than it is. You have to keep going over the area you want to fill in between drying. I absolutely LOVE this brow liner. The color is perfect for my gray/blonde hair. This brow liner is also easy to apply and makes nice thin strokes giving the appearance of real brow hair, of which I have very few. It stays on all day and washes off easy with soap and water....If I go to bed without washing, it does come off a bit but doesn't seem to be on the pillowcase!